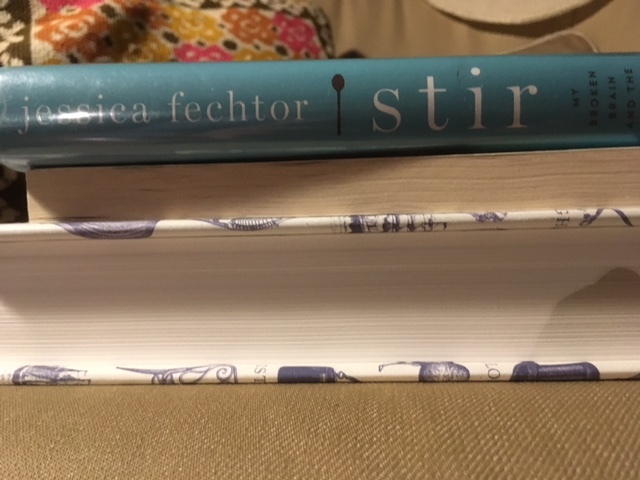 Stir: My Broken Brain and The Meals That Brought Me Home is a cross between a memoir and a cookbook. The theme, however, is not one that many can relate to, although the book will help the reader understand what it’s like to live recovering from a brain injury. At age 28, Jessica Fechtor was on a treadmill when an aneurysm in her brain burst. This is her account of how her favourite recipes helped her to recover. ‘ “How did you bathe before you got sick?” The healthy, unterrified version of myself would have realized that all of this “before you got sick” business was just standard language. The therapist had probably been taught to ask the same things in exactly the same way of each of her patients, many of whom – unlike me – had limited mobility before whatever had landed them in the hospital, orhad suffered debilitating physical or cognitive deficits. But hadn’t she read my file? And if she had, and she still thought these questions applied, was I worse off than I knew? Panic crept along the back of my neck. ‘ “I got into the shower. I washed my hair.” My throat was so tight that it hurt to talk. Why was I speaking in the past tense? As well as this interaction, the account of a hospitalization when Ms. Fechtor develops a fever after surgery would leave anyone with concerns about health care. In other words, this is not a book for the fainthearted. Having said this, the book also describes how the health care system comes back after a worrisome encounter and goes on to deliver topnotch care. It is this kind of honesty that characterizes the best memoirs. Leaving the health memoir to consider the recipes, their integration into the text is extremely powerful. As one reads why certain recipes are chosen, the reader realizes in no uncertain terms that food facilitates health and healing. Ms. Fechtor traces the origins of some recipes to her childhood, others to her travels, but all of the recipes are linked to her own life. It is because of this connection that the food becomes an elixir for her. Think about this for a moment. Think of the foods that you want when you’re not well. Food, preparing food, sharing a meal are linked to healing and comfort in all cultures. Fechtor’s memoir reminds us of this, and tells us in particular how the recipes she cooked, and that others cooked for her, helped her to recover. Food is not just about nourishing the body; it is about nourishing the spirit and this nourishment is linked inextricably to recovery. An example to illustrate this idea could be chicken soup. Many people have a chicken soup recipe in their family that is felt to be almost a magic remedy. This book does have a recipe for chicken soup – and its history in Ms. Fechtor’s family. She also provides the secret to producing a clear broth, but I’ll let you discover that for yourself. If you’d like to get a feeling for Ms. Fechtor’s writing, you can find it on her blog. You can also find some of the recipes there. Why not find one and think about the food you like when you’re not feeling well? I made the pumpkin bread. ← Mental Illness Awareness Week 2016 – What Now?